First Residents Allowed To Return To Damaged Homes In West, Texas : The Two-Way In West, Texas, some of the town's citizens whose homes were damaged by Wednesday's massive fertilizer plant explosion are returning to their homes Saturday, after authorities declared parts of the area safe. But a curfew will be in place, and other areas remain off-limits. 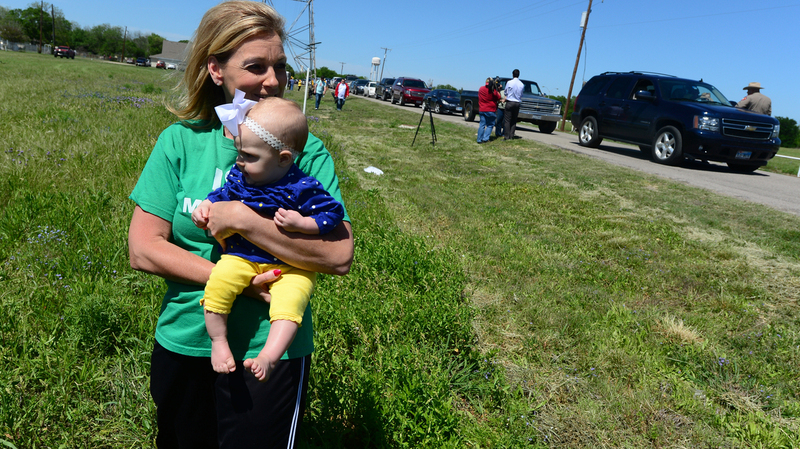 Debby Keel holds her grandchild, Kennedy, as Texas Highway Patrol officers record the entry of residents who are allowed to return to their homes near the site of the April 17 fertilizer plant blast in West, Texas. In West, Texas, some of the town's citizens whose homes were damaged by Wednesday night's massive fertilizer plant explosion returned to their homes Saturday afternoon, after authorities declared parts of the area safe. But a curfew is in place, and other areas close to the blast remain off-limits. "Vanek also warned of lingering safety hazards at the site and announced a curfew for the impact area, as a safety precaution. That's set to start at 7 p.m. Saturday and be enforced at sunset." Many residents whose homes are near the destroyed West Fertilizer Co. facility have not been able to inspect their property for damage since an evacuation was announced Wednesday. And as The Dallas Morning News reports, residents are frustrated by a lack of information. "We need to get some straight answers," resident Pete Arias tells the newspaper. Arias and his wife, Jacki, have been driving to West from Waco every day this week. "Don't leave us hanging," he said. The blast killed at least 14 people and left 200 injured. The AP reports that the plant had not been inspected by the Occupational Safety and Health Administration since 1985. Mourners gathered Friday at St. Mary Church of the Assumption to remember the dead, reports NPR's Wade Goodwyn. "Many of the dead were first responders who were fighting a roaring fire for 30 minutes before the explosion, which was felt 80 miles away in Fort Worth," Wade said on Weekend Edition Saturday. As Wade reports, the death toll was feared to be as high as 60, until authorities clarified their casualty-reporting process. "There was a list that came out that had the number — I think 60 was mentioned," County Judge Scott Felton said. "But really, the way that list was put together, if someone called in, let's say from Dallas, and said, 'Aunt Suzie didn't answer her phone,' well we put Aunt Suzie down on the list of possible missing people. When really, Aunt Suzie doesn't answer her phone most of the time anyway." The disaster has drawn media attention to the town, including from NPR member station KERA in Dallas, where reporter Courtney Collins, a veteran of natural-disaster stories, says that West's tragedy hasn't weakened its residents' sense of generosity and warmth that easily includes outsiders — even reporters. "Mind-boggled, I sipped my tea and flipped through my notes as volunteers arrived with piles of box lunches from McAlister's. A woman encouraged me to eat up and said the food was for the media, law enforcement officials, anyone who was hungry. When the sandwiches disappeared, a mountain of Whataburgers arrived. People from town dropped off bread, lunch meat, granola bars, bottled water. The first thing each volunteer said as they clanged through the door wielding supplies was, 'I'm here to help.' "